My first post, and I don't have a AA yet but wanting to understand some differences and/or what would be the best way to get a nice truck. I'm not pushed to buy, and while I could pull the trigger on one at the right price, I want to find one that will work out best for me. I have long lusted for an old dually after seeing a pic about 20 years ago of a flat bed. I saw a pic of a Rock Moss Green AA flatbed which to me was the bee's knees...I never could understand all of the models, although I do better now...but I knew that the larger trucks were the AAs. I would like a truck that I can use, first and foremost. I also realize that having a pickup is more practical. I am also hoping that you guys will be honest with me, cause I am caught between the AA and the BB. I don't know enough about the reliability of the V8, but it seems like a good thing to have the power. Just that I wasn't sure if the V8 adds a lot of un-needed complication, the 4 cylinder is simple. Also seems that many will come back to life without too much difficulty, but is that so on the V8s also? My next question is on the actual cab and space inside the cab compared to the standard A truck. It seems that the cab is a tad bigger and possibly a bit more space between the steering wheel and the seat. Is that so or is that just an illusion? Some Model As look pretty cramped and I wasn't sure if that is a roadster vs. pickup, etc...Is the width and height of the cab different on the AA than the A? Dually vs. single rear wheels. Are the axles and rear ends the same for these and only difference is how the tires are mounted on the axle? It seems that if you have a dually, you can just use one set of wheels and convert over to an Express. I kind of like the idea of having single wheel rears as it's more practical to drive. However, I have a flatbed that has a 12' bed on it, and I've often thought I would drive it more if it had a pickup body on it, so a smaller flatbed would be more practical as well. The Express is just a cool truck, I won't debate anyone on that...but initially I really just need the cab/chassis which seems like there are more of...I can work out the bed later. Many AAs and BBs don't have beds or have beds that need work. I'm not as concerned about the bed as long as it has a good chassis. I know from experience that it's better to buy a truck that has had most of the restoration done rather than getting one cheap that hasn't. I'm not sure how I will be swayed...it's always easier on the pocket initially to buy cheap, but often wise to buy a full restored one...possibly looking for something in the middle, that I can work on and that is mechanically sound, but that I won't need to have to start replacing all the panels and/or rebuilding the engine right away. I don't necessarily need an Express, since I can make a smaller bed, even a simple flatbed out of wood, but a pickup body could be welded from sheet as well. Seems the cab/engine/frame/suspension are all compatible. Ok, I've asked a lot of questions. Normally I would just go out and buy a truck and come to you folks after asking much of what I should have asked to begin with. Maybe this will prove fruitful for my venture to get a AA or BB. My assumption is that you are not interested in having an original (assembly-line) type of restoration. That requirement makes quite a difference since most "restored" AA's (or A's) are not close to an assembly-line restoration project. Your goal of getting a "nice truck" is basically your judgment call as to what nice means to you. For me, nice would mean an original AA rather than an a overhaul. Given your questions, it seems your knowledge of the AA's is about zip. This should be the correct forum to gain some information. You can also visit aafords.com (see link below) for more information. My assumption is that you are not interested in having an original (assembly-line) type of restoration. I don't know I would classify it like that. I know what I want, and I would prefer to have an original if possible. It all depends on what I find on my quest. I know in the past couple years what I have seen and most do not have complete bodies on them. The BB that sold on ebay for $7500 recently looked like something I would buy, it did look original. However, I wouldn't be adverse to getting one without a bed and building my own either, that's been done with good success. I feel like you're talking down to me because I would do this, and that's ok.
What do you mean by use? You should know the AA is not going to get anywhere fast with a safe cruiseing speed (due to engine rpm and gearing) of 35-40mph. Sure it can haul 1.5 tons and more but you gotta take back roads. Duallys showed up 1930-31 for model AA's. Standard model A pickup has a load capacity of about 500 lbs. Also note depending on your state if you get antique plates on it you cannot haul anything. Model AA shared same engine with the standard model A so they are plentiful. I cannot say anything about the V8's but i think the gears are the same. Im pretty sure they used the same 4 speed trans up into the 40's. Cabs are 100% identical between A and AA. M30/31 have a tad bit more room than 28/M30. There is no seat adjustment but suppliers do offer thinner seat bottoms and backs to gain some inches. yes on the wheels - they use special lugs to add the outside tire. Bed useage you can always build a shallow box for the platform bed so its like a pickup. yup they are. usually they get beat up because they were used on farms for many many years. And the pass side gets beatup worse as theres no mirror overthere and hardly any rear window so backing up can be scary. What I mean by "use" is that I have a small sawmill, and in the future would like something I would be able to haul trees home if possible. Picking stuff up from the hardware store. Lumber, plumbing, stuff like that which I would use a truck for. I will use my current flatbed to pick up machines that are too heavy for my Tacoma, it's small 2-wheel drive base deluxe, so it only has a 1000 lb. capacity. My flatbed is 8,000 lb. payload per GVWR. I would primarily want to haul about 3000 lbs., I rarely go higher, but have a couple machine in the 4000-5000 lb. range which I have moved. I have a forklift, so when I can get someone to load my flatbed, I opt for no trailer as it's easier to drive. I would hope to use an AA or a BB in the same capacity, so that I could eventually sell my current flatbed and only have one. The larger capacity of the dually AA is something I definitely want, a standard Model A doesn't have the capacity, albeit would be easier to drive around town. That is true for my current flatbed also, just looking for practical, easy to maintain, occasional use. Yes, I realize it won't have as much power as my '97 Ford Super-Duty with a 460 V8 engine. I'm ok with taking my time. I currently have a piece of property I'm building a log home on. I would like to drive the truck around the lake, pick things up from the hardware store in town (10 miles from the property) and even be able to pick up fallen trees in the area I want to cut on the bandmill. I want to use it as a truck. I realize they share the same engine, and why I was asking about the 4 vs 8, obviously the 8 will have more power. I was primarily concerned with the simplicity of the 4, and if that even holds true of the 8. I don't know too much about the V8, but know they are rarer, or I should say it seems that less were made. The 4 has that distinctive sound to it, and I've never heard an 8, so not sure exactly what they sound like. I'll try digging around YouTube more. Yes, that answers that, I could not find for the life of me about can space, or even if the cab is exactly the same. I have read that body parts were the same and interchangeable, just wasn't sure about space inside. My concern here was to know if in fact I do find a dually, but am lucky enough to either buy an Express body (I know one is for sale here in the For Sale forum), if it would be possible to remove a set of the rear wheels in the case I wanted to turn it into a single wheel rear end. Mainly if the body would fit on the chassis by removing the extra wheels. Seems that is so. I have also seen there is at least one with a dually which have fenders over the dual wheels, but wasn't sure if that was original. That is certainly something that can be fabricated, and I would attempt doing something like that possibly, not sure. Original is always better. I see some that are whole, but it seems more common out west where I live that they are missing the bed. I know of 3 for sale that do not have an intact bed at this time. Now, as to originality, that seemed to push a button for Neil. Let me say this. I sold vintage guitars for a number of years, and I completely understand about collectibles. I would like to find something that is original if possible, and I would be willing to drive and pick one up...well, as soon as I get my trailer hitch fixed on my flatbed. I don't drive the flatbed too much, but use it when I can't pick something up in my Tacoma. I would still hope to use the AA/BB in the future for similar tasks, and don't need to drive it all the time, it will be a 2nd/3rd car. The price of Model AAs and Model BBs just amazes me that they are not more expensive. Thanks for the answer to my Qs. Much appreciated, I hope I've explained myself a bit better. Sure, I would like to find that AA Express in pristine condition that's been sitting in a barn for 50 years with a cover over it. But much like vintage guitars, there aren't a lot of old finds like that these days. If at all possible I would like to find something with chassis/cab/engine all correct. That is what I tried to explain in my previous message, but I don't think it came out well in words. I don't care about the bed, and if I get an original flatbed/stakebed/other and wanted to convert it to a truck bed, I would take off the bed and save it, but replace it with something else to use possibly...and then OTOH, I might just keep it as-is. Since many I see don't have beds, I am not as concerned about that piece. However, let's talk about restoration...I'm pretty experienced with some of the BS that goes on with vintage guitars, decals changed, necks/bodies refinished to look original, tuners replaced with copies that look the same, entire necks made to look and match vintage ones. I have to believe that most people restoring AAs or BBs replace wood, because wood just doesn't last. So on a flatbed where the entire bed was rebuilt, I realize the title wouldn't match the original truck, but it doesn't seem too much different to me than replacing worn parts. Many people will make wood look old on car restorations, just like vintage guitar folks do. Isn't that a non-original truck? I have a 1946 South Bend lathe that came out of the Levi Strauss factory in San Francisco when it closed down in the 90s. The machine has the original paint on it, not in pristine condition, but in XLNT for 1946 and it still has a Levi Strauss inventory tag on it. I wouldn't repaint that lathe if I can help it, the original paint is worth more to me, just like an original paint guitar. If I can find something in decent shape with good patina, I would keep an AA or BB with the original paint the same. I just need to be realistic and I don't think I will find a truck like that, but stranger things have happened... And the trucks that have been restored have all been repainted for the most part. Allan, I would make one suggestion: find a man who ones one and start a conversation. These trucks aren't for the timid, everything in the chassis is bigger and more robust than the A models. I have a dually flat deck because it just looks more like a truck. Oh, that and the fact express bodies are as rare as hens teeth around these parts. While you are talking to that truck owner ask to sit if you can fit in and safely operate it. I tried on a 28' open cab pick up once and as much as I loved the truck, there was no way I could drive it, it was too small. I don't know anything about your mechanical ability but buying and driving an already done truck will be way more fun than a full restoration. Unless you are like me and insist on doing everything the hard way. Good luck in your search and keep posting! Alan, Welcome to the forum. Sounds to me that you would be a good candidate to own an AA. When I found my AA in late 2010 I knew pretty much nothing about them but had always had an ability to love and restore old stuff. Jumped in with both feet and have learned a heck of a lot since that time. I'm thinking you just might do the same. This forum has been and continues to be a wealth of information. Continue to ask questions and seek advice. If you have not already used a search all of Craigslist search engine to look for one you should do so. I use one often to keep an eye out for the AA's. Decent ones will pop up once or twice a month. Have yet to see the pristine express as of yet. But I do know of a gent in Tennessee that found an express bed in a junk pile in plain sight of a road by his house. No rust, no dents. Lucky son of a gun. Got to be more finds out there yet. The AA's were designed to carry heavy loads. One issue with doing so now with them may be the reproduction tires that are available for them. They don't have nearly the ply's as the old ones. I haven't searched for heavy rated tires for mine because it's working days are over but they might be out there. Having a lighter tire makes for a bit more forgiving ride. Personally I think that there are more 30-31's available on the market and parts are a bit easier to come by for them but I really like the style of the 28-29's so the extra effort to find the right parts and pieces was worth the effort to me. Fun stuff these old trucks. Hi there, I’ve read your posts and it kinda sounds like you have a good idea of the “style” of pickup you want, as mentioned above, these trucks were work trucks, so as such, they were worked like dirt mules until they were wore right out- Spring bushings, king pins, steering. So when folks say they “restored” the truck, be wary , unless you truly know the person, one definition of restored is not everyone’s. My definition of “restored” is to have mechanically brought the truck back to factory specs amongst other ways, and I’ve seen several nice vehicles that were considered “restored” by their owners and that was a new paint job and upholstery, so like you mentioned about replacing the wood in a good guitar compared to cab/body wood, nope, not everyone does. 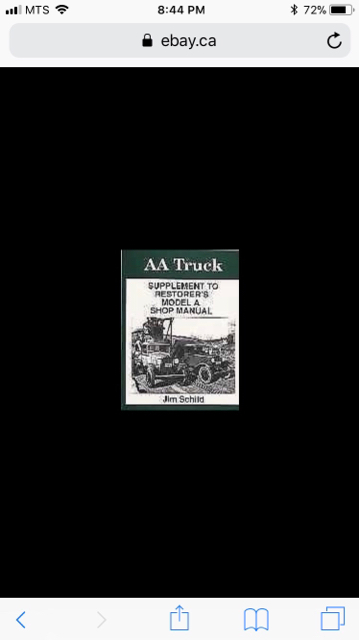 One idea for you might be to get a copy of Jim Schilds model AA manual , lots of info and details between the different AA versions without breaking the bank and well as some of the repair areas. Have fun finding a truck or when the truck finds you! Allan, I would make one suggestion: find a man who ones one and start a conversation. I wasn't going to post any links, but I don't think I'm going to aggressively seek to purchase on of these, but you never know. I've been in contact with this seller, and we've exchanged a few emails. He's done most of the work to get the rear end and drive train redone. The engine runs, and the body is in pretty good shape, sans a bit of rust along the lower cab which can be seen. This is completely workable for me. This one is kind of cool in that it has a farm name on the truck, but the paint is in pretty bad condition and too bad it's not more visible. Repainting it would kind of be a shame, keeping it maybe not so much as I think...this is close to me, the owner lives about 5 miles from me, and it's stored about 40 minutes away from me. I haven't looked at it yet, and kid of afraid that I will buy it...I wanted to understand a bit more before i pull the trigger. Then there is this one, this has all the parts, but the head is currently off the engine. I am a little reluctant to buy one not assembled as I have never worked on one before. This is a 4 cylinder, and I know most will come back to life...might take some persuasion...LOL This is a dually, but the 2nd set of tires are taken off. That was what prompted me to ask about the rear wheels. Now the 3rd one in the area, is a V8, and it looks pretty complete also and runs. Seller hasn't gotten back to me yet. Honestly this looks like it could be a good project also. To follow up my previous comment, this BB was sold a couple days ago on ebay. The $7500 bid came at the last of the auction, and if you look the buyer backed it up by bidding higher. You can't see what he bid though, just that when there are 2 bids at the end with the same buyer and no automatic bids in between, it means the buyer bid more in case someone tries to outbid him. I don't want to get into ebay buying here, just pointing that out...$7500 looks like a good price, even after adding shipping costs in, I'm figuring about $1k to ship a truck across country, can anyone tell me if I'm low or high? There is also this one, but I would hate to change it from a fire truck and I don't think it would be practical. Guys like Neil would cringe at the thought of taking the fire bed off I'm pretty sure...and I might as well...so trying to steer away from this. I tried on a 28' open cab pick up once and as much as I loved the truck, there was no way I could drive it, it was too small. I don't know anything about your mechanical ability but buying and driving an already done truck will be way more fun than a full restoration. Unless you are like me and insist on doing everything the hard way. Alan, Welcome to the forum. Sounds to me that you would be a good candidate to own an AA. The AA's were designed to carry heavy loads. That's why it needs to be an AA or BB if I get an old Model. The Bs seem to be way more popular and most hot rodders want those because they have the room for a V8. However, it doesn't seem very many BBs were manufactured, and the power and suspension on the BB seems much more suited for farms and dirt roads. That is exactly why i mentioned that. Just because a truck looks spanky and looks restored, the underlying mechanics could have been ignored. I can make most anything I would need, I have the metalworking machines to make parts, it just takes me time to copy something. I have also seen people cast parts and machine them into replacements on the Model As, so it's not out of the realm to do those repairs. EDIT: ordered on Abe Books, a place had it for $32. Thanks for pointing that out, probably the only text available on the larger AA/BB trucks? BTW, I bought this magazine article off ebay a few days ago, should be at my house tomorrow. I think I could copy it and share it under the fair use act, not sure if there is an area here on the AA forums or not, or where stuff like that is collected, maybe the Ford Barn has a place also...I haven't been approved over there yet, but registered. Curious, this doesn't look original, but is a very nice job. At least I don't think it's original as the original was stamped. Is that correct? On this site, says 32 BB. Oh my, this is what I need. Logging Truck! I'd like to see that in action, the crane must lift the rear portion, and then lift the log onto both ends...or something like that...crane must be mechanical also, but they did start using some hydraulics on the BBs it seems, at least going from mechanical dump to hydraulic dump. It's original like the one in the picture from Neil. Beautiful truck. While I won't discount finding something like that, I am not going to hold my breath. Stranger things have happened before. I used to own a Moore 24 sailboat, and found one that a fanatic had bought and stored under cover for it's entire life. He raced another Moore 24...it was like finding that sunburst Les Paul in the closet...I bought it in pristine like new condition and raced it for about 7 or 8 years...unfortunately sold it, but used the money to rebuild our kitchen for my wife. I won't say it won't happen on my search for an AA/BB, but it doesn't happen often, and not without a lot of patience in most cases. I'm starting to lean towards the BB for the V8. I am not in a rush, so will just keep my eyes open and talk to the sellers in my area. A lot more AAs, and I will arrange to look at the one closest to me. I saw a 32 pickup, but realized they made a number of 1/2-ton pickups that are not the same beast. I want the larger 1-1/2 ton payload of the AA/BB. Also, anything from '32 on seems to be eaten up by the hot/rat rods. I have no interest in that type of modified truck, I want the original drive train and engine. I wouldn't say my knowledge about AAs was zip, but I will admit that I failed to understand one of the fundamental realities with the AA/BB, being the top speed. I've seen videos of people driving them and they seem to chug along, but I didn't realize that the expected speed is 40mph. However, in understanding the AA helped me realize that there's a better approach for me. There is no reason I need to get rid of my current '97 Super Duty flatbed, it's a 2-ton with a 7.5L 460 V8. Runs pretty good, actually, only has about 80k miles on it. It also has some tool cabinets and a 60 gallon fuel tank and pump. I keep diesel in it for my forklift, but could carry extra petrol for the truck itself too, but it has 2 gas tanks on it and holds about 35-40 gallons. That brings me to the early V8 1/2-ton pickups. These will drive 55 and could replace my current daily driver which is a Tacoma with 1/2-ton payload. As such, I will probably be hanging out more on the Ford Barn as I think I'm going to target a 1/2-ton early V8 truck, it won't replace my flatbed either, but it will replace my Tacoma. I use my Tacoma way more than my flatbed, and as long as I can drive on the freeway at 55, I'm ok. But I do a lot of highway driving and the AA is just not suited for highway miles, as I understand it now.